Well, there's no denying the fact that it has been another wet week down here in the South of England. 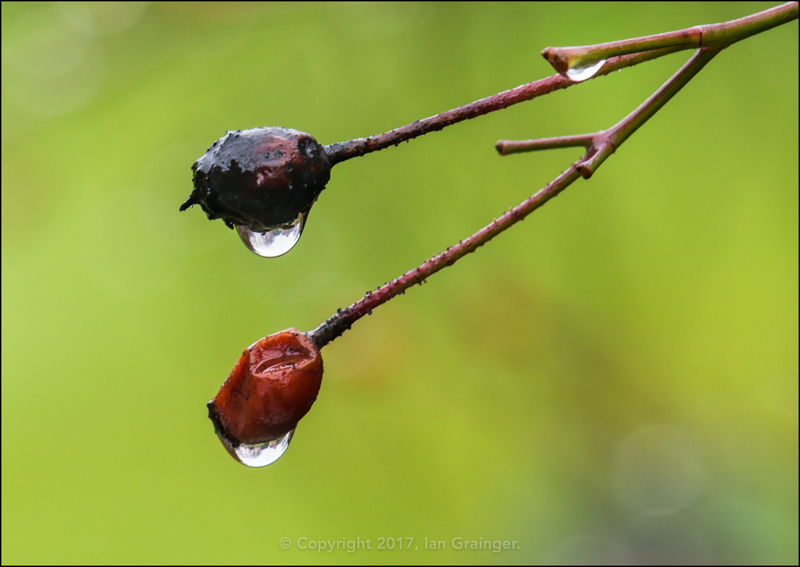 So, what is there to do for the enthusiastic photographer other than to brave the weather, and embrace the dripiness of it all? This is what led me to seek out some, hopefully, interesting subjects, such as these rosehips (or is it rose hips?) 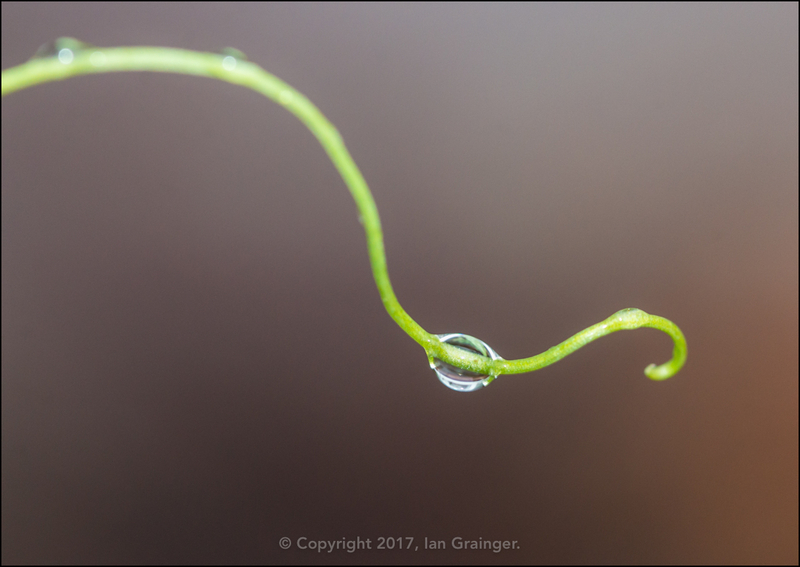 hanging above each other, each with their own suspended droplet. 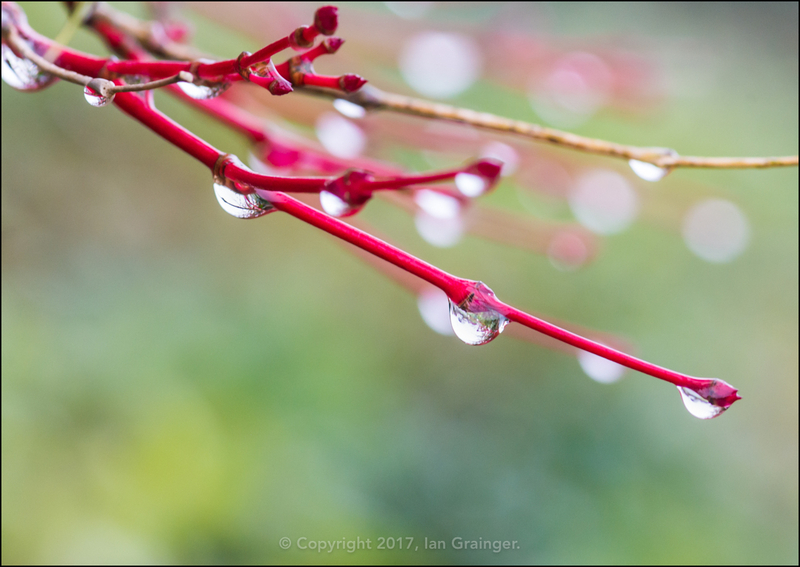 Equally fascinating (well they were to me) were these bright red droplet laden branches, of what I think was, a regenerating Japanese Maple (Acer) tree. 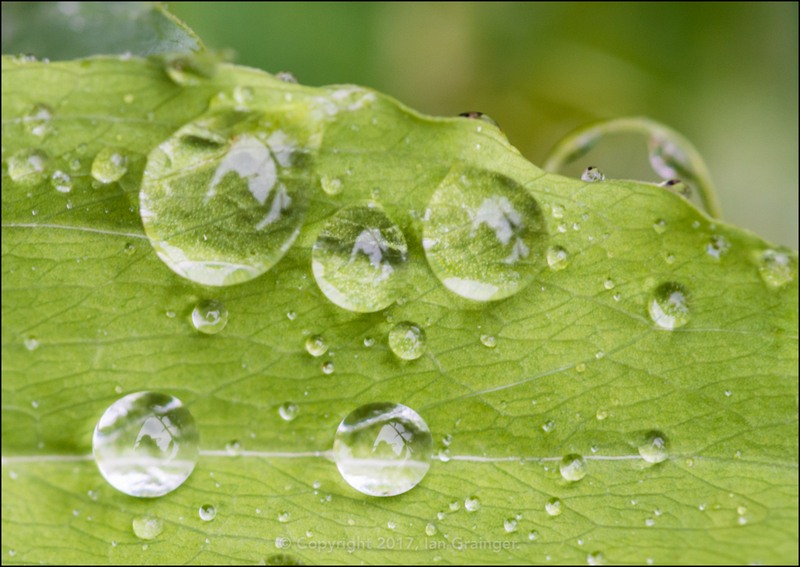 ...as did their raindrop packed leaves. 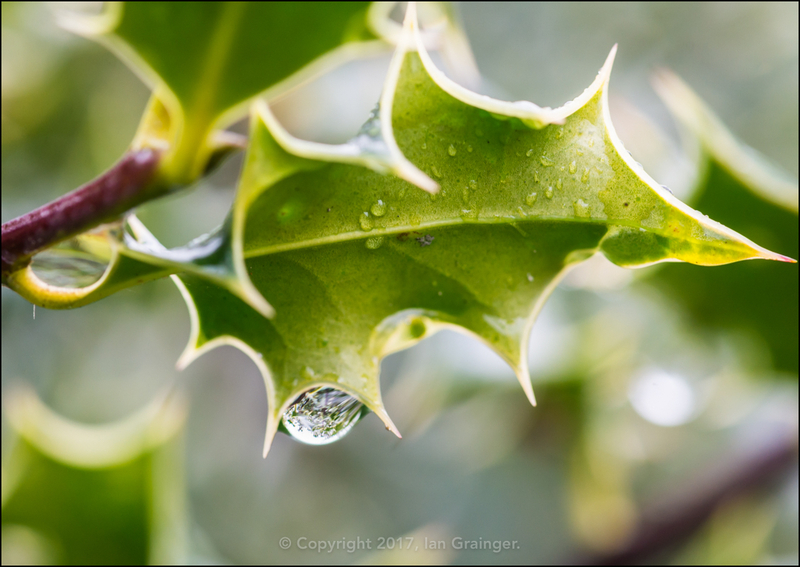 The Holly (Ilex) leaves had fully matured since first springing into existence a month or so before Christmas, and were guarding their visiting droplets well! 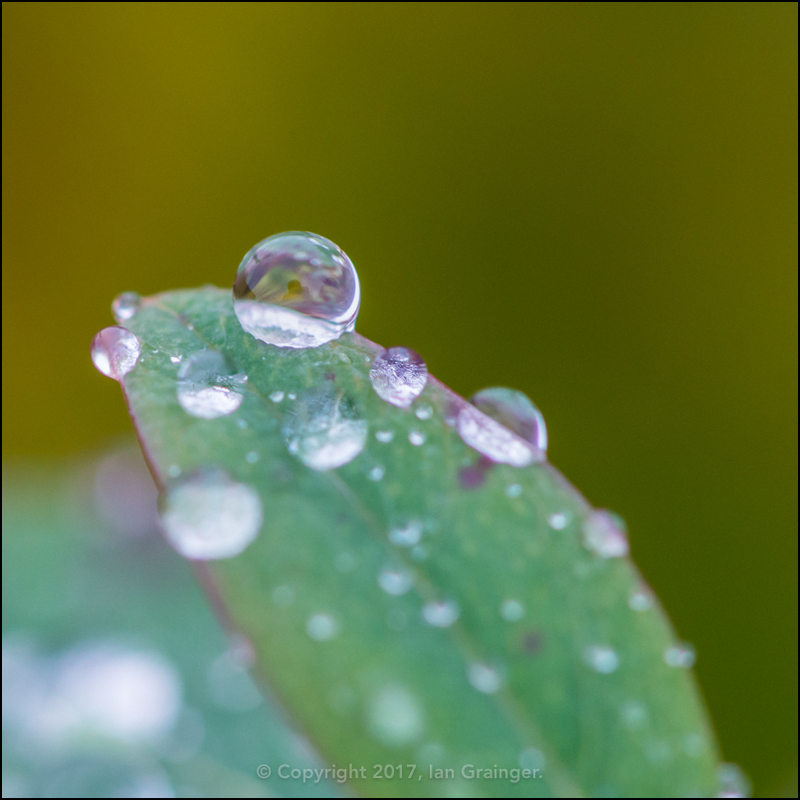 While other shrubs were being less careful with their charges, allowing the drops to rest precariously at the edge of a leaf. 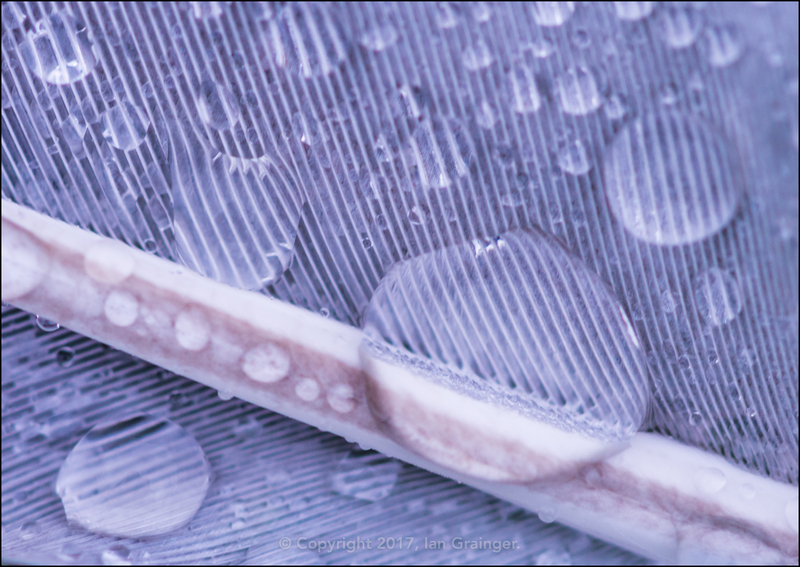 This abstract shot of a wet feather was nearly my Image of the Week this week, as it shows just how waterproof a feather can be. 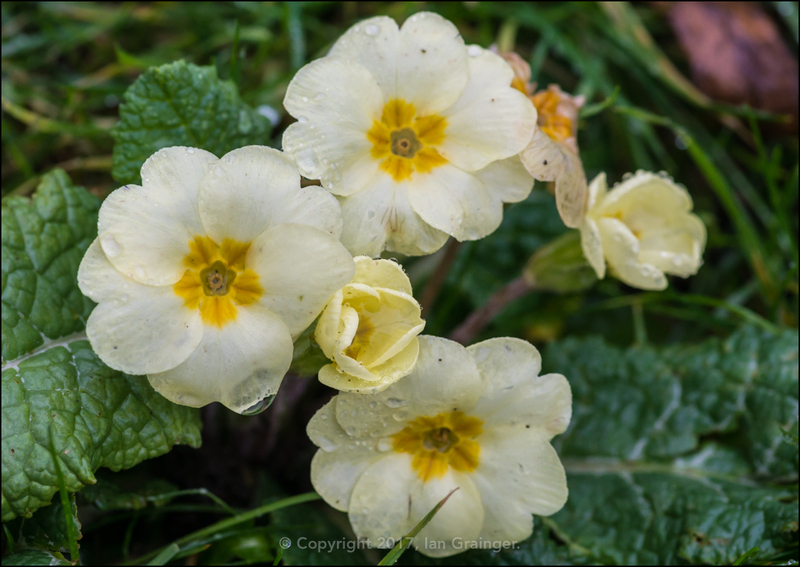 There's still not a lot of floral activity in the garden yet, the English Primroses (Primula vulgaris) being just about the only flower standing up to the conditions at this time of year. 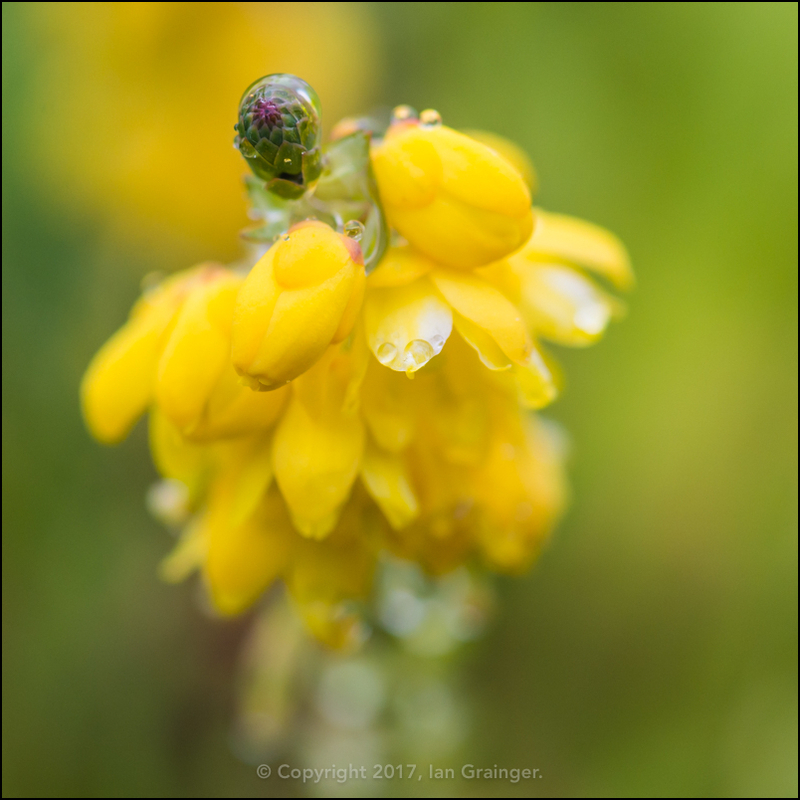 Alas, the Mahonia japonica bush, which has been in bloom since the end of October, is coming to the end of its blossoming period. So now we must await the snowdrops and the crocuses before there'll be any more colour in this winter garden. 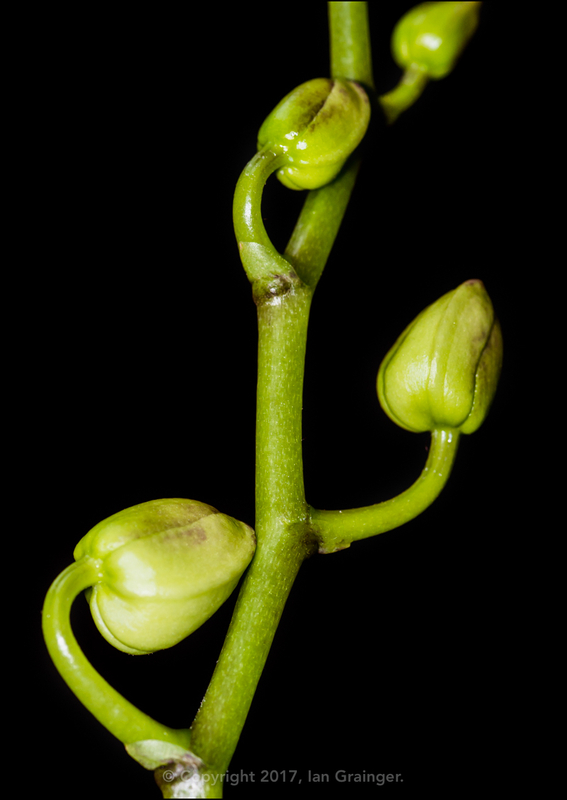 Back indoors, the Moth Orchid (Phalaenopsis) is regenerating, and this year has three separate flower stems to support. 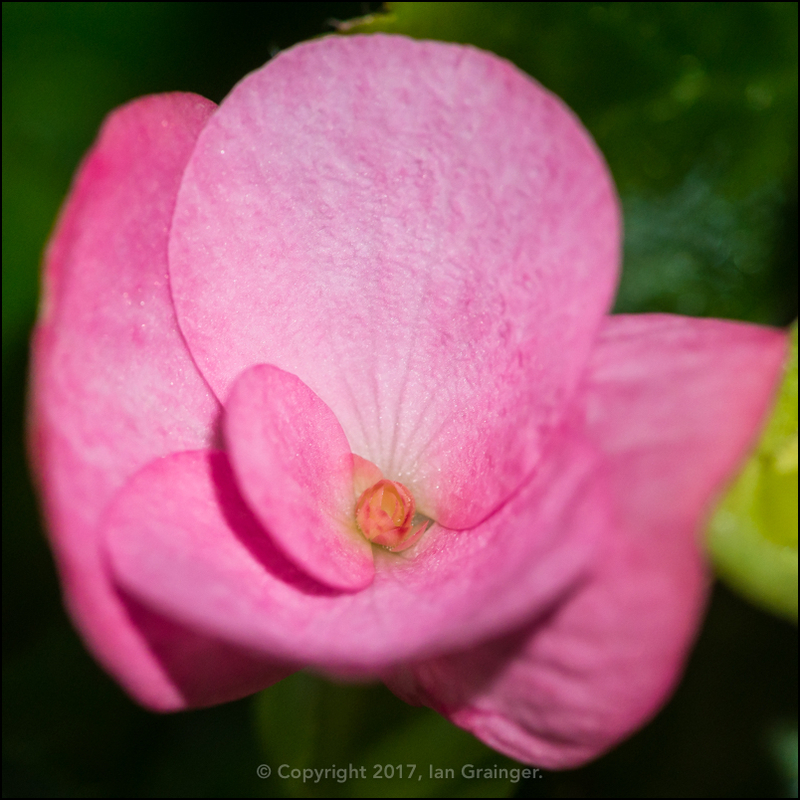 Also, a small Begonia house plant suddenly seems to have lots of flower buds, and these pretty pink flowers have started to unfurl. 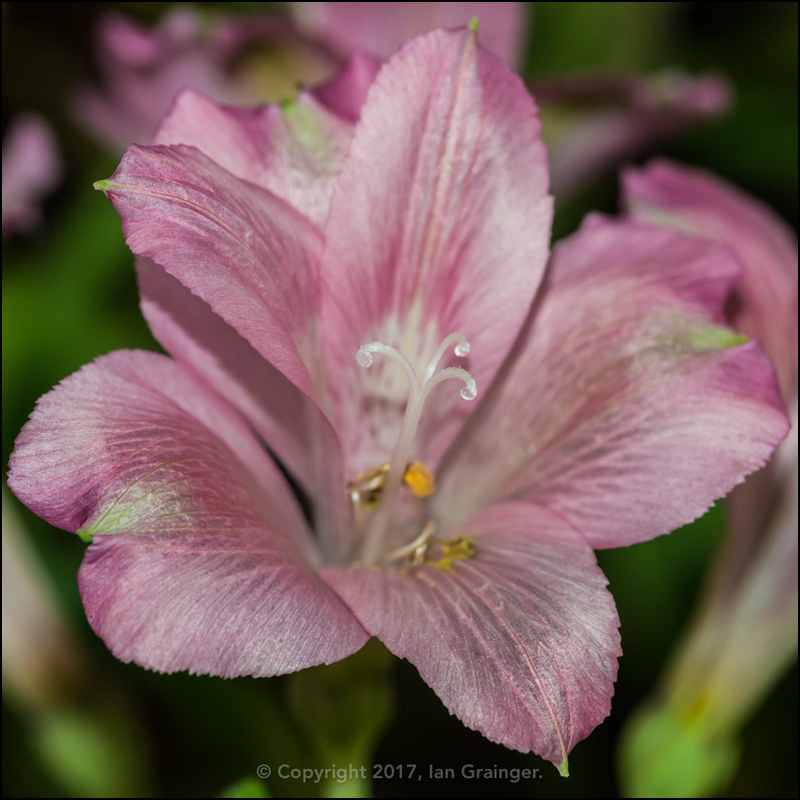 The Peruvian Lilies (Alstroemeria) that were bought as cut flowers for some Christmas colour indoors are only just starting to go back, so have been very good value for money. 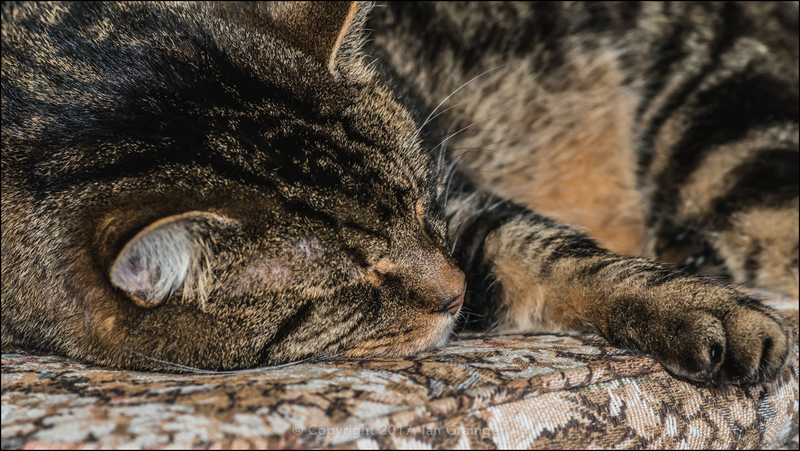 Finally, my photogenic furry friend decided he was going to pass the morning away lying on a favourite cushion, instead of accompanying me around the garden, and getting wet. Sensible chap methinks!